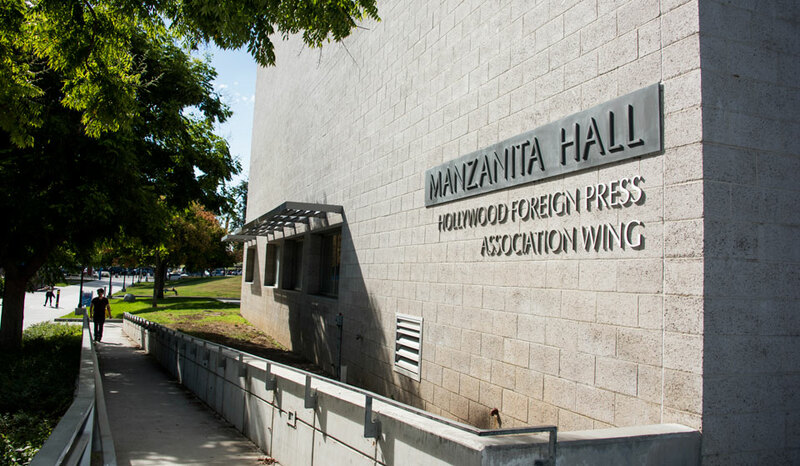 CSUN is dedicating a wing of Manzanita Hall in honor of the Hollywood Foreign Press Association for its support of CSUN's acclaimed film program. Photo by Lee Choo. California State University, Northridge President Dianne F. Harrison will formally dedicate a wing of Manzanita Hall, home to the school’s acclaimed Department of Cinema and Television Arts (CTVA), in honor of the Hollywood Foreign Press Association (HFPA). The dedication, which will take place at 11:30 a.m. on Friday, Sept. 15, is in recognition of a $2 million grant the association gave CSUN’s CTVA department in January 2016 to support students, including the creation of a Hollywood Foreign Press Association Scholars program, and to enhance technology. Manzanita Hall is located near the southwest corner of the campus located at 18111 Nordhoff St. in Northridge. “We are exceptionally appreciative of the support and generosity that the Hollywood Foreign Press Association has shown CSUN over the years,” Harrison said. “Their support is a big reason why our film program is ranked among the best in the world. For more than 20 years, the association’s commitment to empowering the filmmakers of tomorrow has borne fruit at CSUN. The association exposes global audiences to new voices, and its annual grant to our senior film projects reflects its dedication to expanding opportunities for diverse perspectives to be heard. “It’s only fitting that we dedicate a wing of the building where those new voices, tomorrow’s filmmakers, learn their craft,” she added. The evening of Sept. 14, as part of that celebration, CSUN will screen the beautifully restored 1948 classic film “The Red Shoes.” The 35-mm restored print is courtesy of the UCLA Film & Television Archive. Restoration funding provided by The Film Foundation and Hollywood Foreign Press Association. To date, the HFPA has committed nearly $30 million in grants to charities and institutions of higher education, handed out more than 1,500 scholarships and helped restore more than 90 films. Just last month, the HFPA continued its long-time tradition by awarding $2.8 million in grants at its annual Grants Banquet. The donations benefit a wide range of projects, including higher education, training and mentoring, and the promotion of cultural exchange through film. CSUN’s relationship with the association dates back to 1996, with an initial gift of $500. In addition to the $2 million gift, HFPA grants over the years have supported student film projects and helped keep CSUN’s film program current with the latest technology. Students edit in the Hollywood Foreign Press Association Senior Film Edit Suite on campus, and they work on sound design in a state-of-the-art sound mix facility made possible by a grant from the association. CSUN’s Department of Cinema and Television Arts has an international reputation for producing dedicated and talented entertainment industry professionals who recognize the value of hard work as they learn and continue to perfect their crafts. The department currently enrolls nearly 1,600 undergraduate students and 30 students in its graduate screenwriting program. Its alumni work in all aspects of entertainment media, from writing, producing and directing to manning cameras and having the final say in what project is made. Earlier this year, the entertainment trade magazine Variety listed CSUN as one of the top 30 film programs in the world. The Hollywood Reporter also listed CSUN on its list of the top 25 U.S. film schools. Founded in the 1940s during World War II, the HFPA was originally comprised of a handful of LA-based overseas journalists who sought to bridge the international community with Hollywood, and to provide distraction from the hardships of war through film. Seventy years later, members of the HFPA represent 55 countries with a combined readership of 250 million in some of the world’s more respected publications. Each year, the organization holds the third most watched awards show on television, the Golden Globe Awards, which have enabled the organization to donate nearly $30 million to entertainment-related charities and scholarship programs. For more information, please visit www.GoldenGlobes.com and follow us on Twitter (@GoldenGlobes) and Facebook (www.facebook.com/GoldenGlobes).